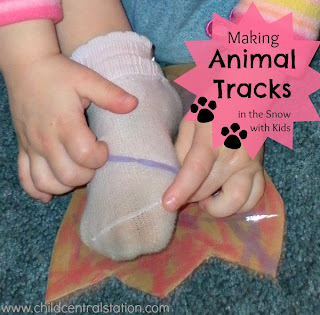 Abbie from over at Greening Sam and Avery posted this great idea about making your own track makers! I've been meaning to try it out for some time, but like many things on the to do list.... it took us awhile! First, I helped the children cut out some "funny" feet patterns out of cardboard. I think most of ours came from a pizza box, but any cardboard will do. The children wanted to personalize their funny feet, so while I was helping each child with the various steps, they dug into the marker stash. After they had completed coloring, I helped them cover both sides of the cardboard with packaging tape. (I don't have any photos of this, as it took both of my hands to do and I didn't have a photographer handy!) Then, instead of using the string and holes we opted to staple heavy duty rubber bands on our feet. I think either way would work. The string might last longer, but this worked for us. 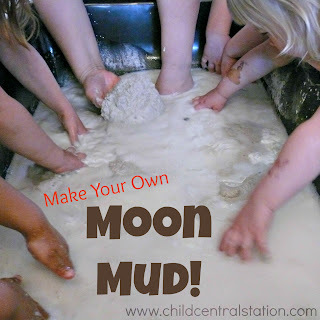 The children had a lot of fun with their "smelly, smelly, Ogre feet!" They had more fun with them inside than outside. The packaging tape made them SUPER slippery outside. I think if we opt to try them outdoors again we will have to add something for traction on the bottoms. We still had a lot of fun, and the tracks did look considerably different from our "normal" footprints! Friday, I'm going to be featured over at ABC & 123 as part of their weekly "Feature Yourself Friday" Hop on over and check it out! Love that they decorated them. The rubber bands was so clever and so much easier for them to put them on than having to tie for each kid. Very smart. Since refused to move in hers I didn't even get to see that they were slippery, but duh! Wonder how traction could be added. Congrats on the feature! Heading over to check it out.